Inspired by the depth and brilliance of a summer night, the Coravin Limited Edition, in warm black and light gold, is an ultra-exclusive wine experience. Pour any wine, in any amount and preserve the rest of the bottle for weeks, months or even years, with this powerful statement piece. 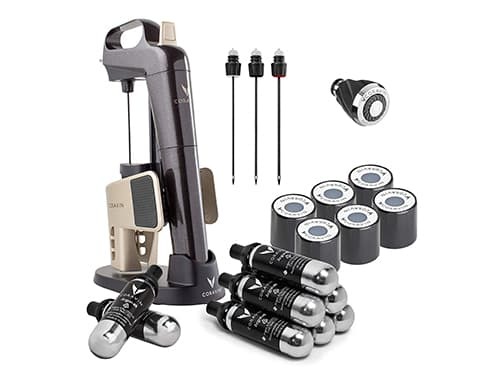 You get the full Coravin experience with an included elegant display base, the revolutionary Coravin Aerator, 3 distinct Coravin needles, a set of 6 standard size screwcap accessories, and 8 Coravin Capsules to pour up to 120 glasses of wine. • Irresistible Starry Night Color – Inspired by the night sky, this warm black color with light gold accents is sophisticated and elegant. This collectible piece has a hue that seamlessly fits any space and occasion. • Coravin Wine Needle – Specially designed to be gentle on your corks and pour wine both quickly and smoothly. • Texturized Clamp – The unique design of the Limited Edition clamp system offers a generous, rubberized clamp area that is easy to use and fits snuggly around the bottle neck ensuring a secure hold and effortless pour. • Load Cell Technology – he capsule-loading chamber creates the perfect amount of force for an airtight seal, ensuring no gas escapes. • Elegant Classic Base – Made of sturdy zinc with a classic matted black finish, this base elegantly showcases your Coravin System in style. • A total of 8 Coravin Pure™ Capsules – Contain more than 99.99% pure argon gas to protect the remaining wine from oxidation and pour up to 120 glasses 5 Oz. glasses of wine. • Coravin Aerator – Attach to the spout of your Coravin Wine Preservation Opener, for silkier, smoother, and more aromatic results in seconds, equivalent to decanting wine for approximately 60 to 90 minutes. • Three Distinctive Coravin Needles (Faster Pour Needle, Vintage Needle, and Replacement Standard Needle) – The Coravin Three Needle Kit provides you with the perfect access to any bottle – from aged vintage bottles to easy to drink table wines and everything in between. • 6 Screw Caps – The Coravin Screw Cap expands the possibilities of the Coravin Wine Preservation Opener by allowing people to pour and protect wines closed under screw cap for up to three months. This kit includes 6 standard size, which fit 98% of screw top wine bottles.